We want your feedback! Below each scene you can post your feedback and discuss what you like and what we can improve on for that particular scene. Your feedback will help us continue to improve and create the best Virtual Reality fantasy experience possible. Join the Whorecraft VR discussion on reddit! 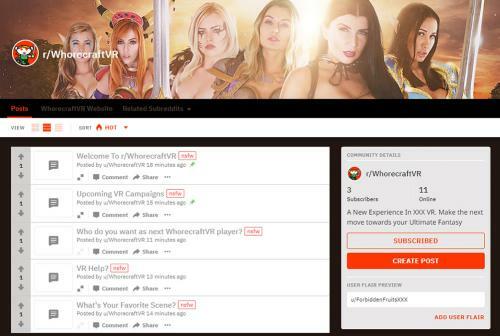 Continue the discussion at the Whorecraft VR subreddit r/WhorecraftVR Here you can discuss the latest scene updates with other fans, find special announcements on upcoming releases, obtain VR help and provide your suggestions for improving the Whorecraft VR experience.